Tiny apartments are all the rage in NYC right now as the city's first micro-unit building nears completion, but they're nothing new for New Yorkers like producer Andrea Mitchell, a seasoned small space vet who knows how to use interior design techniques to create the illusion of more room. Case in point: Andrea's stylish studio in Manhattan's Greenwich Village. Although it's just 325-square-feet in size, its 18-foot ceilings, soaring skylight and a few other clever design tricks make it look and feel much more spacious. In addition to the home’s skylight and tall windows, its southern exposure allows for plenty of natural light and views of downtown. Andrea even has room for friends and family to stay the night thanks to the roomy couch and several pieces of double-duty furniture. 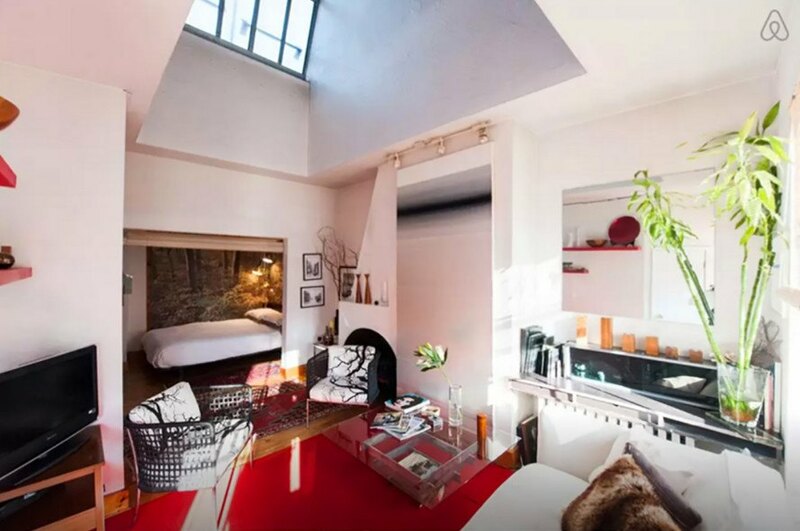 Pretty impressive for just 325 square feet! It looks so spacious. If only every tiny house looked like this one. I would love it as a respite on the side for just me. A great place to vacation away from family. "The inspiration when furnishing was keep it open clean modern with a twist of cozy," Andrea told us. "There was a fireplace at one time with just a hole where it once was, so I got an electric fireplace to give it a cozy feel. Due to the size of the apartment, it needed depth, so the forest wall mural made the perfect sense and it worked." In addition to the home's skylight and tall windows, its southern exposure allows for plenty of natural light and views of downtown. A floor-to-ceiling forest mural creates the feeling of more depth in the alcove bedroom. The kitchen is small but efficient. "My strategy for small spaces is very simple," Andrea explains. "Danish Modern furniture is perfect because it's usually small in size. But you don’t want to go too small. The couch is 7 feet, so it's big but the chairs are small and not clunky. Plus keeping walls WHITE is critical since colored walls tend to make things look smaller. An accent of color on walls like my red shelves gives a modern splash and matches the red FLOR rug. IKEA is a big help with small apartments, but you don’t want to go all IKEA. Personal touches of your style mixed in with store-bought, cookie cutter things is always best. Shabby chic! I got most of the things in the apartment at a flea market in NYC." The bathroom is clean, simple and white.